Amid steady, vocal opposition to Amazon’s plans for a Long Island City campus, a new wave of efforts have been underway by local business owners and civic leaders in an attempt to showcase the broader narrative on the ground toward the e-commerce giant’s development. Recent days have seen the release of an online petition in support of HQ2, started by a group of businesses in Long Island City and steadily gaining steam, along with a press conference by an alliance of Queens leaders that pushed back hard on the staunch, hardline opposition the project has faced since the official HQ2 announcement months ago. The new efforts come as two new polls, one funded by Amazon, show that New Yorkers are largely in favor of the company locating a new campus in Long Island City and the deal it reached between the city and state for it. They also follow a Washington Post report published late last week that said Amazon is possibly reconsidering its campus siting in Queens due to local opposition. The petition, created one week ago by “LIC Supports Amazon,” has since gained 2,950 signatures in its bid to show that the project has considerable support far and wide. The local businesses behind the petition are located on Vernon Boulevard, and include places like Manducatis Rustica, owned by an active community leader, and Modern Spaces, the real estate agency with a strong presence in Astoria and Long Island City. Eric Benaim, CEO of Modern Spaces and a fervent supporter of HQ2, said interest in the project has always been present, but has been drowned out or quelled due to fear of backlash. Benaim believes Long Island City “won the business lotto” with Amazon selecting the neighborhood for its new campus, and said his support for the project would be unwavering regardless of his role in real estate. “How on earth is 25,000 jobs a bad thing?” he said, noting half of the jobs at the new headquarters won’t be in tech and are therefore open to a wider range of people. News of Amazon thinking of pulling out of Long Island City, believed by many to possibly be a leveraging tactic, made the petition all the more urgent, Benaim said. He e-mailed a letter to thousands of his clients past and present on the day of the report urging them to sign on to the petition and voice their support for the project. 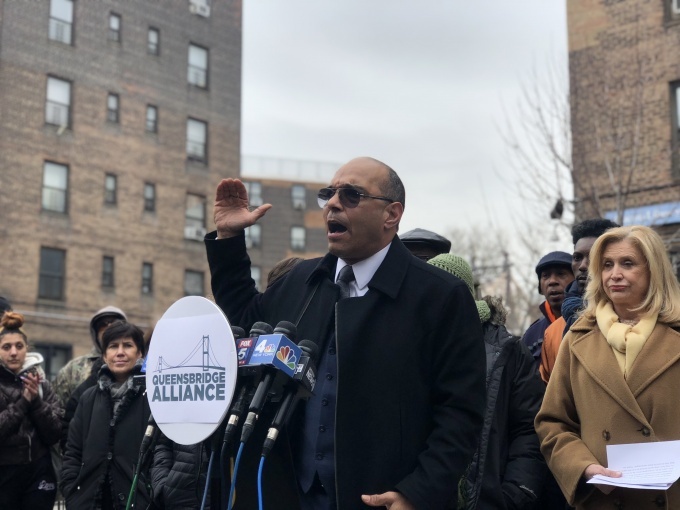 Opportunity was also the focal point at yesterday’s press conference at the Queensbridge Houses, attended largely by the presidents of tenant associations for four area public housing complexes and non-profit leaders that have been in talks with Amazon on HQ2. The press conference rebuked the steadfast resistance to Amazon’s campus, and pointed to the benefits of having a seat at the table in HQ2 talks. Taylor, who co-chairs the workforce development group within the Amazon HQ2 Community Advisory Committee, took issue with the number of activist groups that have campaigned against the project, and especially criticized an outreach effort at the Queensbridge Houses over the weekend, even accusing the organizing groups of spreading misinformation. “I’m incensed when I see people…from other places convene upon Queensbridge, knocking on doors telling people because of Amazon, you’re going to lose your apartment,” he said. “If you’re concerned about gentrification—that happened 15 years ago,” Taylor said. 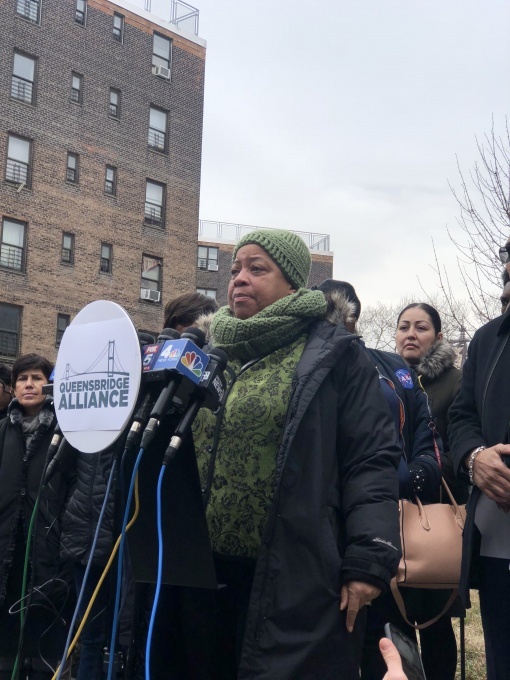 Taylor, along with the tenant association presidents for Queensbrige, Ravenswood, Astoria and Woodside Houses were also displeased by the activist groups for what they saw as an affront to their years having served and vouched for the Queens neighborhoods they’ve called home for decades. “The people want a fair hearing and the jury is still out, so let the process play out,” he added. The petition and press conference, which took on an “Amazon HQ2 is no empty promise” tagline, come at the same time the company is looking to increase public support for its Long Island City headquarters with a public campaign. The campaign has so far taken on the form of mailers touting the project’s benefits, and starting new hiring and education initiatives for local residents and schools, among other steps. Today, meanwhile, groups like the Queens Chamber of Commerce and the Old Astoria Neighborhood Association traveled to Albany to voice their support for Amazon’s campus in the borough. The company’s executives will face a third round of oversight hearings in City Council later this month. The project’s buildout is expected to start in 2020 after state approvals are attained, a topic that has hit the spotlight after Gianaris, an outspoken critic of the deal, was nominated to sit on a state board that could change the course of the planned campus. I am curious. How many hospitals, schools, more cops, sanitation, firehouses, electrical grids, subway/ bus service will be added to the already over crowded LIC area. So far with the influx of 10, of thousands Hipsters, I have not seen any additional services added to our community. We have only one hospital, no new schools, and the rest is just status quo. Add another 25k people, it should be a lot of fun. No community review of plans? Sounds familiar. In fact, I completely agree. Sign the petition. I signed too – sadly, too little too late. At least we know who NOT to vote for the next go around. I didn’t see any of those Amazon protesters and local politicians when NYCHA buildings didn’t have heat? I didn’t see any those Amazon protesters when LIC went through extreme gentrification and nothing was done for Queensbridge housing. You guys don’t speak for us! The people in QB need good employment opportunities. There are over 3,000 children living in Queensbridge. We have commitments with Amazon to set up training centers and special programs specifically for our community to acquire skills needed for those new jobs and some of you see that as a bad thing? SCREW YOU!!! Bigbucks Bezos is your guy. clueless rubes. the ‘jobs’ available to the people of the projects will be of no great economic help. No one there will be making close to a third of the that 150k they claim. Want. Theirs would have been amazing for the children of queesnbridge getting training in tech. I am glad we are finally seeing some push back against this so called “opposition”. HQ2 will be an economic boon for the area and will balloon tax receipts. There was an article in the Times last week that the city is now bracing for tax receipts to fall short of expectations to the tune of 1B this year. Could it be that the anti-business climate in NYC is chasing firms and high net worth individuals away? You bet it is. If we want a robust social safety net, we need a way to pay for it. Amazon will bring 25000 high pay, high skill jobs to the city. What does the opposition want? The opposite? 150,000 is max pay – likely highest person on the campus. Everyone else in the building will make less, and less, and less. The salary does not allow for the people to work there and live there. They’re coming in from elsewhere – clogging up the already congested and outdated subway lines and filling apartments in our already highly competitive realty market. If we’re falling short on taxes, we should be getting that 3 B in tax money from Bezos – not waiting the DECADES it would take to recoup that loss. You are ill-informed. $150k is the average salary for the 25,000 jobs. Some positions will pay a lot higher (senior execs) and some lower (entry level positions). The 3 billion in tax money you mentioned is the amount of tax savings Amazon will get over 10 years time in return for producing jobs. These tax incentive programs have been around long before Amazon and are available for any company regardless of size. There is no 3 billion of cash waiting for us if Amazon decides against NYC. I wish people like you were better informed. When Amazon chases away the local stores and their tax dollars, and the minimum wage workers are reduced to ordering online and having their streets clogged with delivery boxes, who will be responsible for the decline in their quality of life? That’s what happened in Seattle. You may not like the facts but flinging around psychobabble doesn’t change them. the key to getting any decent job is getting the skills that a company needs, don’t sit behind a megaphone and complain. Start getting these people of Queensbridge the into programs to gain the skills and get the degrees they need, this is an incredible opportunity for those willing to put the time in and learn. Its actually insulting to say that these jobs aren’t for Queensbridge residents, they can be for anyone who works hard for it. City and State colleges are FREE now so there is really no excuse. Stop complaing people, teach your kids to go out and get it. Do good in school, SATs, apply for city/state school for a degree….. and see it thru to the end and you’ll be alright. “Do good in school” ? Enough with the “you must be a landlord” crap. I’m also against Amazon but you sound as stupid as the people saying “you must be Bramer or Gianaris” if you don’t support Amazon. Since you guys “We’ve been sitting at the table from day one” I guess you will take credits for people not being able to afford to stay in 5 miles range of that great project. If you truly believe that ANY of the residents from Queens Bridge Houses will get full-time with a salary of $150k. You need to be realistic. Those jobs are going to potential employers that they are bringing from other places – not NY surrounding areas. They have their people. The rest of the other jobs will be going to $15.00 per hour for anyone who is in 5 miles range -likely these will be 90%part-time 10%full-time. Take a road trip to Seattle and see how much love is there for Amazon ..Oh by the way did you also agree to Helipad for all of Queens residents as well? Let him take 7 train, he can get taste of what we getting every day! This is mind blowing how possibly you can be pro …as long as you own property here that makes sense …the question to all of the members of Queens Chamber of Commerce and the Old Astoria Neighborhood Association what property you own in LIC or nearby area???? The link bellow is for the people that are trying to survive in LIC ..NOT for greedy real estate and landlords!!! Don’t be narrow-minded. The city will fix the subway issue once the HQ2 open up. Without Amazon coming, Queens Bridge Houses will stuck in their shitting housing forever, with no job opportunities and no subway improvement anyway. Hahaha, oh wow, you have got some rose-colored glasses going on don’t you? That’s a joke. They should have fixed it BEFORE this. The subway has been crap for YEARS while the development continued on- they didn’t care about it then and they still won’t care when Amazon moves in. As long as Bezos is happy because he’ll fly over it all in his helicopter, then no one else will care either. Fix things before? tell me where the money should come from? oh wait, if those people stop using subsidized housing, city may have money to fix subways! time to move out and pay the actual rent guys!! Don’t you guys think that a 4 million square foot office campus will 25,000 employees will need to hire thousands of people with limited education as janitors, cafeteria workers, doormen and women, document production services, security guards, maintenance….the list goes on and on. And the brand new NY state labor law requires a minimum pay rate of $15 for everyone in the state – try to keep up! NYC public housing rental rates are controlled by law – no one is coming in to out bid them to lease their homes. These are all reasons why the leaders and people of Queensbridge were out in force yesterday – they want Amazon in LIC – unlike No Jobs Gianaris or Jimmy Van Job Killer. Those low pay jobs are included in that 25,000 – those are not 25,000 jobs at 150k/year. The 150k salary is the max. People need to read real articles and get the full statistics on what these jobs are and HOW LONG IT WILL TAKE to recoup the 3 BILLION in tax dollars Bezos is robbing from the city. THIS IS MONEY OUT OF YOUR OWN POCKETS!!! $150k annual salary is the AVERAGE…Big difference. You are so ill informed it’s embarrassing. The money can’t be “out of our pockets” if it doesn’t exist yet – a large chunk of the money s tax incentives so it’s only gained if jobs are created. Any other employer would also be entitled to many of the same tax incentives. Please do your research from credible sources. It’s good to hear about something other than the mythical 25,000 $150,000 jobs. But who would protect the minimum wage jobs and raise the minimum when inflation devalues it if the workers can’t bargain collectively? With no union they would be powerless. Leaving wages, hours, health insurance, pensions, vacations up to the discretion of an indifferent corporation is naïve. Pretty much all my voting life my mantra has been “compared to what?” Okay, true, the Amazon deal isn’t perfect, got that. But what is the alternative being offered? Do we seriously believe it won’t just be more luxury high rises built and sold by developers who will collect their profits and leave the area more jammed than ever with nary a thought (or nickel) to create job opportunities or improve the infrastructure or quality of life? Please, people, can we not let ourselves be dragged into National Dysfunction of seeing every issue as black or white, us versus them, and remember that even flawed proposals can be the best possible way forward. I’m also from QB. I’s sick and tired of these ppl from other neighborhoods and boroughs coming here telling us what to do. I support April Simpson all the way. We need to do what’s best for Queensbridge and get the best Amazon deal possible. Amazon has proven to be destructive in many ways, so no, I don’t agree with your conclusion, but I understand how you got there. Because you’re thoughtful and care about the community, I think that you should run for office (if you’ve not been elected already).